The increasing rate of stress and trauma to children, which includes divorce, family breakdown, violence in society, the media, and "failing school system", has produced a “shell shocked” generation suffering from anxiety in many cases. The challenge for clinicians is to recognize anxiety in children and help them cope. Other co-occurring disorders (e.g. behavior problems, medical conditions, depression, ADHD, learning disabilities, selective mutism) will also be discussed. Emphasis will be on creative interventions involving insight-oriented, cognitive-behavioral, biological, mindfulness, expressive arts and family systems approaches. Apply the “Three Ingredients” framework for understanding how, why and when anxiety occurs in children. Draw from 10 specific stress-management strategies to target the “when” factor in child and adolescent anxiety. Recommend 8 steps teachers can take to reduce anxiety in the classroom for more focused attention. Implement at least one effective treatment strategy for each of the 7 key anxiety disorders to modify sources of stress. Designate 3 steps that schools can take to create a safe, calm environment for meeting the needs of anxious students. Create a therapeutic alliance with parents to improve the effectiveness of clinical treatment with anxious kids. 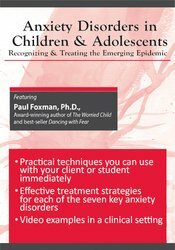 Paul Foxman, Ph.D., has led hundreds of workshops throughout the U.S. and Canada, and he has appeared on television and radio as an expert on the topic of anxiety. His books include The Clinician’s Guide to Anxiety Disorders in Kids & Teens (PESI, 2016), Dancing with Fear (Hunter House, 2007) and award-winning The Worried Child (Hunter House, 2004). He also co-authored a casebook, Conquering Panic and Anxiety Disorders (with Glatzer) (Hunter House, 2002). Dr. Foxman is known for his knowledge and clarity, sense of humor, compassion, and engaging speaking style. Dr. Foxman is a clinical psychologist, as well as founder and director of the Vermont Center for Anxiety Disorders. In 1985 he co-founded the Lake Champlain Waldorf School in Shelburne, VT, now flourishing from kindergarten through high school. Dr. Foxman has over 40 years of clinical experience in a variety of settings including hospitals, community mental health centers, schools and private practice. Dr. Foxman’s education includes Yale University (B.A. in Psychology), Peabody College of Vanderbilt University (Ph.D. in Clinical Psychology), and training at the Department of Psychiatry of Mt. Zion Hospital in San Francisco, the Kennedy Child Study Center in Nashville, and the San Francisco Psychoanalytic Institute. Financial: Dr. Paul Foxman is the founder/director of the Center for Anxiety Disorders. He is an author for Hunter House and receives royalties. He is an author for Jason Aronson, Inc. and receives royalties. He is an author for Da Capo Press and receives royalties. He receives a speaking honorarium from PESI, Inc.
Nonfinancial: Dr. Paul Foxman co-founded the Lake Champlain Waldorf School. New York Educators: PESI, Inc. is an approved sponsor of CTLE with the New York State Education Department's (NYSED) Office of Teaching Initiatives. Provider #23567. This self-study activity will qualify for 6.25 Approved Continuing Teacher and Leader Education (CTLE) Hour(s), in the area of Pedagogy. Hours are based on full attendance. Board required certificates will be sent after the program. PESI, Inc. is an AOTA Approved Provider of continuing education. Provider #: 3322. This self-study course qualifies for 6.0 self-study contact hours or .6 CEUs in the Category of Domain of OT and Occupational Therapy Process. The assignment of AOTA CEUs does not imply endorsement of specific course content, products, or clinical procedures by AOTA. Course Level: Intermediate. Expires: 1/25/2021. North Carolina Psychologists: This self-study course is designed to meet the Category B Requirements of the North Carolina Psychology Board, provided it is within the scope of practice of psychology. Please retain all documents to provide to your board should this be requested of you. This activity consists of 6.25 clock hours of continuing education instruction. This activity consists of 6.25 clock hours of continuing education instruction. Pennsylvania Psychologists: PESI, Inc. is approved by the Pennsylvania State Board of Psychology to offer continuing education for psychologists. PESI maintains responsibility for the program(s). This self-study program qualifies for 6.25 continuing education hours. Kentucky Psychologists: PESI, Inc. is approved by the Kentucky Board of Examiners of Psychology to offer continuing education for psychologists. PESI maintains responsibility for this program and its content. This self-study activity will qualify for 6.25 contact hours. This course is offered for .6 ASHA CEUs (Intermediate level, Professional area). **ASHA CEUs are available on this course from 03/01/2019 to 02/29/2019. PESI, Inc. will submit ASHA CEU Requests to the ASHA CE Registry on a monthly basis; ASHA CEU Requests received before 03/01/2019 or after 02/29/2019 cannot be reported.